Thanks to all you guys who’s supporting us & enjoying the effort of our struggle to keep the music business dirty & down on it’s knees! 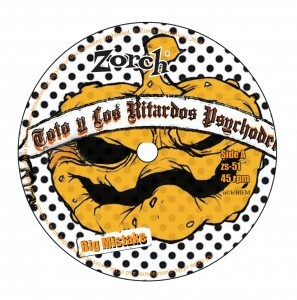 For your pleasure we announce that we’ll release the Toto Y Los Ritardos Psychodelicas debut vinyl 7″ in february. But even now you can get your own copy, with super customized, by the band made covers. Photos, spray paint, markers, beer, booze & strictly limited to 100 numbered copies.